The local scene comes alive at 3! This new hot spot is the place where people meet to have fun, relax and enjoy themselves over signature cocktails and creative, New American cuisine. Neutral tones and natural elements pervade the chic and inviting decor. 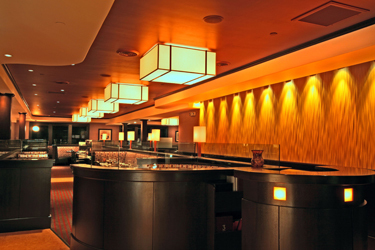 The trendy lounge area is a dynamic meeting place, abuzz with conversations. The menu is extensive and well rounded, with creative twists on classic foods and something for every taste and craving. 3 was recently awarded the very rare Platinum Plate from TV Diner with Billy Costa who said 3 has "all the style and appearance of a big city bistro without the attitude" and the menu was moderately priced for the "superior quality, artful presentation and flawless service."